Rawalpindi is not a city where fortunes are made. It is a refuge for those seeking relief from the backbreaking labors of rural life and a home for those fleeing the violence on Pakistan’s troubled frontier with Afghanistan. ‘Pindi, as it is known, may be a stifling metropolis where crime goes unpunished and hard work unrewarded, but it also offers a chance at the first rung of a very long ladder toward financial stability. Yet that ladder goes only so high. The greensward of the Rawalpindi Golf Club teases the poor with dreams of the good life, but its gates are firmly closed. In Rawalpindi, there are no holes in the fence that divides the classes. That doesn’t stop people from trying to slip through. It was in Rawalpindi that Mohammad Amir Ajmal Qasab, the surviving gunman from the terrorist massacre that claimed 165 lives in Mumbai last November, took his first step toward infamy. In 2007 he visited a market stall run by Lashkar-e-Taiba , an Islamist extremist group that has been blamed for the Mumbai attacks, among others. Qasab, at the time, was neither particularly religious nor particularly violent  just one of millions of poor young men in South Asia trying to cross the fence to a better life, existing in a shadow land between aspiration and extremism. What makes Qasab unusual is not that his story is rare but that we know its outlines. 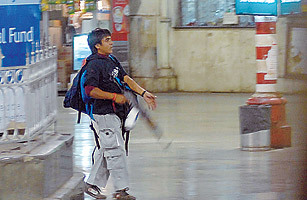 After he and Ismail Khan, the leader of the attack, shot up the Victoria Terminus railway station in Mumbai, they were stopped by police at a roadblock. Khan was killed, but Qasab was taken into custody, and he dictated a long confession to Mumbai police. TIME has obtained a copy. As a legal document, it is of questionable value; it was almost certainly obtained under duress and has been widely circulated. But as a narrative of the transformation of a country boy into a jihadist, it is believable and  more than that  important. Understand Qasab’s story and you begin to understand why young men throw in their lot with Islamic extremists, why Pakistan may be the most dangerous country in the world, why the half-century-long dispute between India and Pakistan over Kashmir is not just a local problem, why education reform in the poor world is an issue of national security in the rich one  and why draining the swamps in which terrorism is spawned has been so difficult. In the early 1990s, Pakistan was in a state of euphoria. Islamic holy warriors, many from cities like Rawalpindi, had defeated the Soviet army in Afghanistan, and jihad was on everyone’s lips. In 1990, Muslims in Kashmir  the Himalayan territory that India and Pakistan have been arguing and fighting over since 1948  rose up against Indian rule, and the mujahedin soon found a new cause. The Pakistani military used the jihadi movement, hoping that guerrilla warfare would destabilize its enemy India where conventional warfare failed. Jihadi groups in Pakistan collected donations for Kashmir. Young men signed up for training camps, where they concentrated on physical fitness and learned how to use weapons. Jihad wasn’t just a diversion from ordinary life; it was a rite of passage. But after Sept. 11, 2001, everything changed. Pakistan, given no choice by the U.S., stopped supporting the Taliban regime in Afghanistan, which had allowed jihadi training camps to flourish on its soil. On Dec. 13, 2001, a band of Pakistan-based fighters attacked the Indian Parliament. Two weeks later, the U.S. government placed LeT, one of the jihadi groups thought to be behind the attack, on its list of proscribed organizations. The next month, Pakistan’s then President, General Pervez Musharraf, bowed to international pressure and declared that no Pakistan-based group would be allowed to commit terrorism in the name of religion. Musharraf banned five jihadi groups that his army had long nurtured. To Musharraf’s interlocutors in Washington, this must have sounded like progress. But his decision just shunted the jihadist mentality underground. With a nod and a wink, organizations like LeT re-emerged under new names. The camps were officially closed, but training shifted to hideaways deep in the mountains, where government officials could ignore them. Recruitment continued, strengthened by the perception of unjust  and U.S.-driven  persecution of Muslims. It was in this climate of official duplicity that Qasab arrived in Rawalpindi. He was not seeking his shortcut to heaven. Rather, he says in his confession, he followed a friend in search of riches. “As we were not getting enough money, we decided to carry out robbery,” he says, and they scoped out a house. Qasab does not say in his confession if he ever robbed the house. It doesn’t really matter. Crime and terrorism are intertwined  illicit weapons-trading, drugs, smuggling and kidnap-for-ransom schemes fund terrorist networks all around the world. In Pakistan, the connection is deeply ingrained. “When someone commits a crime,” says Asghar, “there are so many hands to support him but so few to pull him out. And if I feel guilty for what I have done, I go to mosque. There I am invited to jihad, and I am given a license for paradise. That is where crime and terrorism meet.” From the LeT stall, Qasab was directed to the group’s offices, where after a brief interview, he was given the address of a training camp and money for the bus. He was on his way. It would be convenient to think of Qasab as a psychopath, exploited by cynical handlers who corrupt young men in the name of religion. In fact, his origins are ordinary. In his confession, Qasab, now 21, says he was born in the village of Faridkot, in Pakistan’s Punjab province. He is said to have been a typical teenager, not especially religious, albeit with a reputation as a troublemaker. His family is poor  his father sells fried snacks at a bus station  but owns its own house. Qasab attended the local primary school; at 13, he left the village to live and work with his elder brother in Lahore. See pictures of the days of terror in Mumbai.